Samsung has announced that three of the four "Pro" tablets it unveiled at last month's Consumer Electronics Show are now available for pre-order, and will ship and be on shelves of US brick-and-mortar stores next Thursday, February 13. Sammy also revealed their prices – but if you're expecting a bargain-basement deal on any of the new Android-equipped fondleslabs, you may want to keep your charge card in your pocket and hope that market pressures force the prices down into markdown land. But don't count on it. These tablets seem, on paper at least, to be solid offerings that should do well in their "Pro" niche, especially if road warriors can talk their companies into paying the tab (pardon the pun) for the most expensive of the lot: the 12.2-inch Galaxy Note Pro, which runs $749.99 for the 32GB model and $849.99 for 64GB. That big fella's prime competitor, the decidedly smaller 9.7-inch iPad Air, by comparison, would cost you $499, $599, $699, and $799, for 16GB, 32GB, 64GB, and 128GB, respectively. Those iPad prices are for the Wi-Fi only model, by the way – an apt comparison to the new Samsung tablets, since the ones that are now available for pre-order are Wi-Fi only, as well. A 4G LTE version of the 12.2-inch Note Pro, Samsung said, will be offered by Verizon in the US next month, but its price has not been revealed. The fourth member of the Pro quartet, the 12.2-inch Galaxy Tab Pro, will also debut in March. The other newly available Galaxies are the Tab Pro 8.4 at $399.99 for 16GB, and the Tab Pro 10.1 for $499.99 with the same amount of storage. All four of the new units run Android version 4.4, aka KitKat, and all four have a WQXGA resolution of 2560-by-1600 pixels at a 16:10 aspect ratio – which, on the 8.4-inch model, results in a display with 359 pixels per inch, a pixel-packing performance that Sammy trumpets as resulting in "the most pixel dense tablet on the market." There has been some rumblings among the technorati that the Samsung would drop, scale back, or de-emphasize its new Magazine UX user interface, the replacement for the Galaxies' long-in-the-tooth TouchWiz UX, and which was unveiled along with the Pro line at CES. The scuttlebutt was that Google was none too happy that not only was Samsung straying far afield from Android qua Android, but also that it was doing so in way that might crimp some of Mountain View's in-UI revenue opportunities. Well, if that scaling back is in the cards, its not in the Pro line – Samsung proudly emphasized the multi-windows Magazine UX in its announcement of the new fondleslabs' availability. 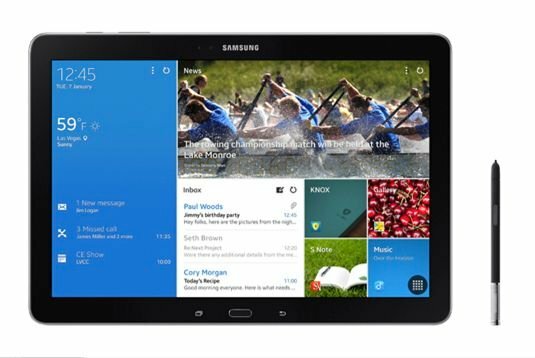 "All tablets in the Note Pro and Tab Pro series are outfitted with Magazine UX, Samsung's innovative new user interface that's built right into the home screen layout," it wrote. "This customizable layout brings users' favorite and most-frequented content – games, notes, apps, e-mail and more – to the forefront, offering direct access to content with a single touch." To stick a follow-on thumb in Google's eye, Samsung is providing buyers of the new tablets access to its Galaxy Perks "premium bundled content" program, which it says provides "over $800" in products and services, including a three-month Hulu Plus trial, a one-year Bloomberg Businessweek+ subscription, six months of Cisco's WebEx Premium 8, and more – including a $25 credit at Google Play.